I know it’s been a while since I’ve posted. There are a couple of reasons for this. Obviously, the holiday (Thanksgiving here in the USA) is partly to blame. However, early last week I got a bit caught up in writing a testimonial for QuietSpeculation.com’s Online Reseller Hall of Shame. The testimonial sparked something of a back-and-forth between myself and the retailer, and this exchange took up a lot of my mental energy and writing time. If you’re curious, check it out, but be sure to read the comments for (what I hope is) the resolution of the situation. Also, I’ve been a bit underwhelmed with my control deck, so I’ve been mixing it up a bit. 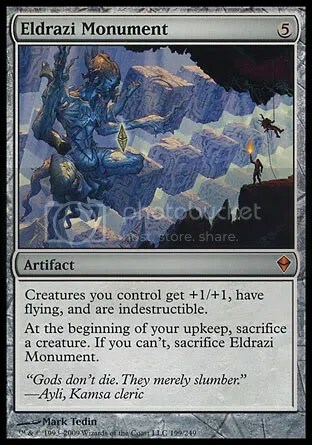 I built Eldrazi Green, which I have to say has been a blast to play. My only criticism of the deck is fairly obvious—it has zero interactions with any opposing threats. It simply beats and smashes and hopes that’s enough to win. So far, for the most part, that has been enough to win, but I don’t realistically expect it to continue that way. 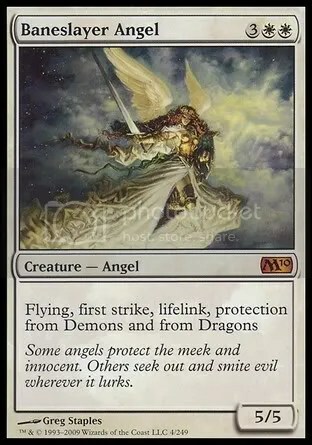 The other deck I’ve been playing is the list that Martin Juza played in the Standard portion of Worlds, nicknamed “Juza Angels” by fellow blogger Johnny Wheels. This is quite a solid list that can cast a turn three Baneslayer Angel on a fairly regular basis (thanks to the help of Lotus Cobra). 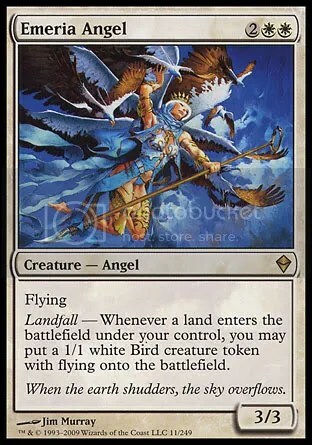 The rest of the deck is packed with Standard all-stars (Elspeth, Noble Hierarch) and newcomer Emeria Angel (who is better than I had expected). The only matches I’ve lost with this deck were against a pseudo-mirror (a race to who could stick an unanswered Baneslayer) and against a Grixis Control list wherein game one I was mana screwed and game two I double-mulliganed into mana flood. I definitely made some mistakes in these last two games, but I don’t know that it would have made much of a difference. 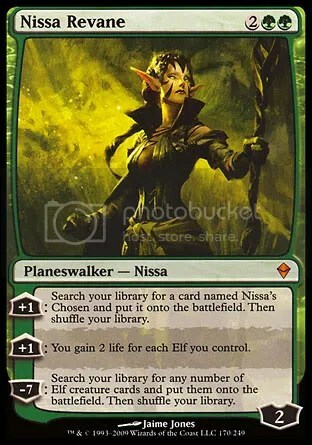 So, since I haven’t been playing any blue decks, there was a dearth of content for this blog. But worry not, I’m working on testing a new list later this week, so I should be able to have some new blue content early next week. Oh, I almost forgot! Yo! MTG Taps! Episode 5 – Five With Worlds Decks is now available for download! This entry was posted in Uncategorized and tagged blue, deck, decklist, islands, mtg, mtgcast, Podcast, standard, t2. Bookmark the permalink.